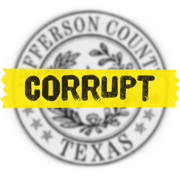 I recently wrote an article exposing massive corruption in Beaumont, Jefferson County, Texas. Specifically, a hidden Video was released that shows an Illegal Arrest & Perjury by Democrat Texas Judge Layne Walker and Jefferson County Sheriff Deputies. Jefferson County is no stranger to corruption from Beaumont Independent School District Scandals leading to State takeovers, to Beaumont Mayors going to jail. Things are bad in this Democrat controlled East Texas county. John Morgan, a Beaumont attorney, is helping to lead the fight against these corrupt politicians. Morgan is sticking up for these victims of the corrupt Jefferson County system. Unfortunately, corrupt Democrat Judge Layne Walker retaliated against Morgan by taking away his kids for NO REASON except that Morgan was on the wrong side of the political line. Now this Judge is trying to punish a process server who was trying to do his job and serve the Judge lawsuit papers. 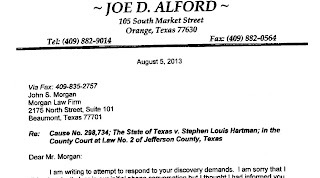 Stephen Hartman tried to serve this Judge at his house but the Judge pulled a gun. The Judge then refused the papers at his office. Hartman then went to the only place the judge could be found in public, the courtroom, and waited behind the bench for a good time to ask the bailiff to come over so he could tell the Bailiff about needing to serve the Judge. The Deputies, on orders of the Judge, had Hartman arrested and falsely claimed he crossed the bench and was shouting. A secret video recording now shows that Hartman did NOTHING wrong and was falsely arrested. After Hartman was arrested, Jefferson County Sergeant Steven Broussard confiscated Hartman’s video recorder and TOOK IT HOME and tried to delete it. Broussard and another deputy, Tony Barker, also lied about Hartman in their reports. After Morgan forced the recorder to be produced by the officer, the truth was seen on video and Jefferson County Sheriff Mitch Woods recommended Sergeant Broussard be fired and Deputy Barker be suspended for 5 days. Broussard went ahead and announced retirement before he was fired. 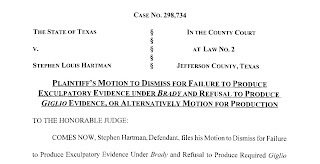 Prosecutor Alford refuses to release evidence and he absurdly says statements against Hartman are “unimpeachable” even though 2 of the officers lied and video proves Hartman is innocent! Morgan demanded that Alford turn over all evidence they have in the case against Hartman, including all video and audio from the courtroom. Alford responded and refused to hand over the evidence. What is even more absurd is that Alford suggested the witnesses and evidence are “unimpeachable” even though the officers involved have been disciplined and video proves Hartman did nothing wrong! Jefferson county deputies are liars and criminals. Especially the thug that became the Chief of Police. I had a deputy tell me personally that he can get deputies to lie whenever he tells them to. And he is now one of the officers in the Jeff County SWAT clowns.